Be the first to share your favorite memory, photo or story of Douglas . This memorial page is dedicated for family, friends and future generations to celebrate the life of their loved one. Douglas Eugene Smith was born on November 14, 1952 in Elizabeth, New Jersey to the late Eli and Henrietta Smith. He was the second child of three children. 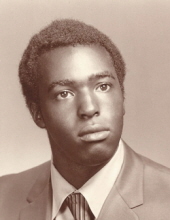 Douglas graduated from Abraham Clark High School Class of 1972. Douglas worked for Hayward Pool Company for a long period of time before furthering his education in New York City. Douglas was a valued employee as a Main Frame Operator for New York Board of Education where he was employed for the last 17 years. He was a member of Local 2627 and DC37. Douglas was known for being a kind, quiet and loving person. He also enjoyed watching sports and was an avid fan of the New York Knicks and the Oakland Raiders. He was a devoted son, brother and uncle. Douglas played a major role helping his mother raise his sister Valerie's two children, Jamaal and Eboni. Douglas was predeceased by his brother, Jeffrey "Scobie" Smith; sister, Valerie Smith; and nephew, Aciento Smith. On Wednesday, January 30, 2019, Douglas was called home at home in Linden, New Jersey. Douglas leaves to cherish his fondest memories, his nephew, Jamaal Smith of Linden, New Jersey; niece, Eboni Shareef of Linden, New Jersey; two great-nieces: Raven Smith of Jersey City, New Jersey and Legacy Smith of Linden, New Jersey; three great-nephews: Jamaal Smith, Jr. of Piscataway, New Jersey, and Chandler Smith and Chase Smith of Linden, New Jersey; and a host of dear relatives and friends. To send flowers or a remembrance gift to the family of Douglas Eugene Smith, please visit our Tribute Store. "Email Address" would like to share the life celebration of Douglas Eugene Smith. Click on the "link" to go to share a favorite memory or leave a condolence message for the family.